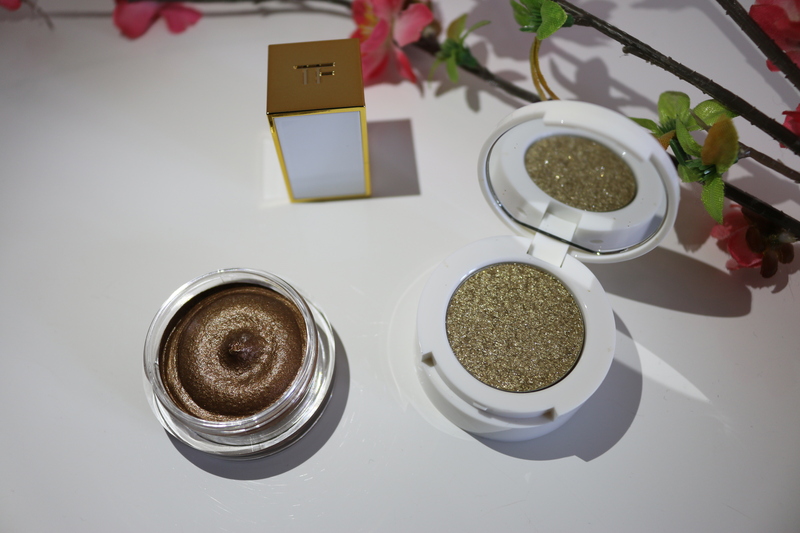 The packaging is the same as Golden Peach: a clear plastic pot for the cream eyeshadow and a white container for the pressed glitter on top. The lid of the glitter compartment has a full size mirror. You twist the top part to get access to the cream pot. The cream eye shadow has quite a warm undertone. It is coppery, almost red shade with micro shimmers. It is intensely pigmented. So it is best to apply a small amount to the centre of the eyelids and build up slowly. You can wear it as sheer or as opaque as you desire. Over primer, it lasted on my oily lids for 8 hours before signs of creasing. It is very comfortable to wear, creamy and does not emphasise texture. The glitter eye shadow powder is a light-medium dirty/antique gold with gold sparkle in a transparent, sheer base. I find finger is the best applicator as with most glitter shadows/powders. There is very minimal fall out during application with this glitter shadow. The colour lasted well on my oily lids for 8 hours before creasing slightly. Layering Naked Bronze glitter on top of Naked Bronze cream eyeshadow yield a glorious, beautiful lighter copper, bronze sparkling shade. The finish is unique, glossy and almost wet-looking which does not emphasise texture of my eyelids. These swatches were taken in direct, natural sunlight. Tom Ford Naked Bronze Cream & Powder Eye Color is very to use yet the finish look is sophisticated and glamorous. You can achieve a perfect, bronzed summer look by pairing it with some rosy orange blush and orangey red lipstick. I purchased my Tom Ford Naked Bronze Cream & Powder Eye Color from Harvey Nichols. It is a limited edition and you can hunt for it also at Selfridges, Harrods and House of Fraser(online only). Have you tried any items from Tom Ford Soleil Collection Summer 2015? Are you tempted to purchase Tom Ford Naked Bronze Cream and Powder Eye Color? Those colors are gorgeous especially for summer! These are so pretty! I’ve always wanted to try Tom Ford, but the prices are kind of daunting! So lovely, bronze is my upmost favorite go to eye color. I think I need the Bronze Cream in my life! My pay check is a goner!